Three Greenpeace activists were taken into custody after deploying a floating banner in the atrium of the Hart Senate Office Building in plain view of a favorite destination for polluter lobbyists - Senator Lisa Murkowski's Washington DC office. 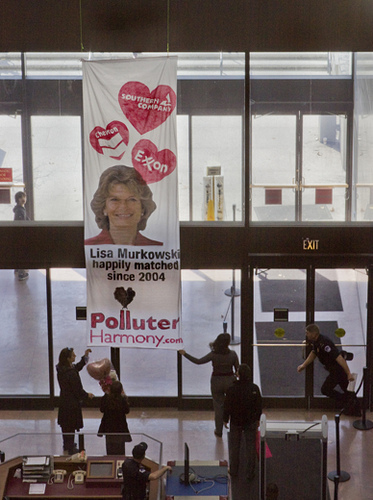 The banner exposed Murkowski's close relationship with dirty energy interests and promoted PolluterHarmony, a spoof online dating site launched just before Valentine's Day to help connect polluters, industry lobbyists, and politicians. Murkowski's continued counterinsurgency against Obama's EPA is part of a multilateral attack by corporations, corporate lobbyists and their friends in right wing think tanks and front groups. Multiple lawsuits and petitions have been filed in recent weeks throwing roadblocks in front of EPA Administrator Lisa Jackson. A security guard attempts to grab banner as it rises to the ceiling of the Hart Senate Office Building near Senator Murkowski's office. In case it wasn't abundantly clear from her efforts on behalf of polluter lobbyists to trash the Clean Air Act, last week Senator Murkowski blatantly showed her dedication to dirty energy interests by demanding that her vote for global warming legislation can be bought by permitting oil drilling in the Arctic National Wildlife Refuge. Murkowski knows her efforts to block the Clean Air Act from addressing global warming are music to the ears of the Dirty Coal corporations filling her campaign coffers, but perhaps she feels a need to do even more to please her Big Oil contributors? Two weeks ago, Senator Murkowski led a national conference call with the Chamber of Commerce climate-progress opposition team to rally corporations to lobby Congress to stop EPA from regulating global warming pollution. On the call, Murkowski referred to her resolution to stop the EPA as "the" climate vote of the year. It is extraordinary that while Alaska is especially threatened by global warming, and entire villages are lost, Senator Murkowski continues to promote the interests of the very industries that are driving climate change. While Alaska is transformed by warmer temperatures, drilling for oil in the Arctic National Wildlife Refuge would further threaten important habitat for caribou, polar bears, and other wildlife. Promoting reckless oil drilling and trashing the Clean Air Act might entice dirty energy interests to write campaign checks but they have no place in sane national energy policy.